I first wrote about Origen Financial in 2012 when the company was already in the process of liquidating itself. At the time figuring out its intrinsic value was no easy job since it owned equity interests in a couple of complicated asset-backed securities trusts. This is no longer the case though since the company has sold substantially all of its assets and it is now a cash box. Origen Financial was initially planning to simply distribute the proceeds of the sale to its stockholders and cease to exists, but it announced an alternative plan last month that would allow it to continue to operate as a mortgage REIT while current shareholders would be given the option to cash out at Origen’s current net cash per share value using a tender offer. Origen is currently trading at $1.64/share while it has approximately $1.82/share in cash. If the tender offer is successfully completed a return of >10% is possible in a couple of months. If the tender offer isn’t completed the downside is probably minimal. In that case Origen would continue with its original plan to liquidate and still be able to return the majority of its current net cash position to shareholders. The potential return is lower because in this scenario the liquidation will probably take more time and the company would incur more costs. But I think that those costs should be less than $4.5 million: the current spread between Origen’s market cap and its net cash position. In the proxy statement that was mailed to shareholders to vote on the proposal to sell all of Origen’s assets and to dissolve the company they estimated a $1.69/share liquidation distribution. In the press release related to the alternative proposal Origen notes that due to a 3-month delay in the sale of their assets a liquidation distribution would be lower than the original anticipated amount. Had Origen proceeded with dissolution and distributions of its net cash, the estimated per share amount hat would be distributed is less than the amount estimated in Origen’s proxy materials for the special meeting held in October. The reason for this lower per share amount primarily is attributable to additional operating expenses and transaction expenses resulting from an unavoidable three month delay in completing the GoldenTre transaction. Current members of Origen’s Board of Directors have indicated that they will elect o continue as post-closing Origen stockholders in respect of a substantial portion of the Origen shares they own. stockholders after the execution of definitve transaction documents, which are anticipated to be completed before mid-February 2015. More detailed information on the tender price and a comparison to management’s estimated distributions upon disolution, the MRECS transaction and the post-closing busines plan for Origen wil be included in the tender ofer materials. So I think that the downside is limited at roughly zero and that there is at the same time a high probability that the alternative transaction will be completed, resulting in a ~10% gain. Sounds like a good bet to me, and a decent spot to park some idle cash. This entry was posted in Portfolio and tagged ORGN.PK on February 17, 2015 by Alpha Vulture. Haven’t been really busy this month looking at stocks thanks to some vacation time, but wanted to post a quick update that I sold the last few shares of my position in Origen Financial today. The majority of my sell order was already filled earlier this month. The trusts taking a bit longer before the optional redemption thresholds are hit isn’t a big problem, but it’s also not so clear what will happen at that moment. The Origen Financial corporate structure has high overhead costs: last year the company generated ~13M in cash flow while paying out ~11M in dividends. The ~2M difference are costs related to running Origen Financial. If you are confident in a liquidity event in a few years time these costs wouldn’t be a big problem, but if the assets remain locked up in an inefficient structure this would be a good reason for a big discount, and it would in fact be easy to argue that the company is currently overvalued if you don’t expect a reduction in overhead costs in the future. Taking these new insights in consideration I would not have bought Origen if I didn’t already own it, so I decided to sell my position. I’m going to continue to follow the company, and maybe there could be an opportunity to re-enter a position if there is more clarity about future costs. This entry was posted in Portfolio and tagged ORGN.PK on August 28, 2012 by Alpha Vulture. With the first half of 2012 behind us it seemed a good idea to me to quickly review my portfolio. Not because a time frame this short is really useful in evaluating how good or bad certain picks have been, but a portfolio is not a static entity. Some positions could become more attractive over time because of new developments, insights or changes in price, while other positions become less attractive. The performance of the various positions is summarized in the table below. As is visible I have a few positions with a small loss and some positions with a pretty good return with SALM being the icing on the cake. I wish I could attribute this to buying undervalued companies with good downside protection, but this is not yet even getting close to getting a sufficient sample size. Besides: the company with the highest return was (and still is) also the riskiest company based on the amount of leverage. I have also included how I would change the rating of the attractiveness of the various positions based on today’s stock price and information. I have summarized my reasons for the changes below. In most cases more details can be found in the comments on the original write-up or in a followup posting. ORGN.PK: Have to say that this stock really showed the value of this blog for me. Got great feedback from multiple readers and realized that it’s currently trading closer to fair value than I initially thought. The positive return thanks to the fat dividend is purely luck and only showed I didn’t fully understand the risks (and luckily in this case the rewards!) of the interest rate swaps (now terminated). CNRD.PK: Small re-rating based on some errors in my original write-up, mainly because there was less excess cash on the balance sheet than I thought. DSWL: I’m more convinced than ever than I’m right that it isn’t a fraud thanks to the increase in regular dividend plus a special dividend this month. But since the stock price is also up a decent amount I think it’s less attractive today. SALM: It’s up a lot, but still trading at a near 20% FCF yield. The refinancing possibility next year (missed this in my first write-up) and massive insider buying after I bought it are the reasons to upgrade my rating. 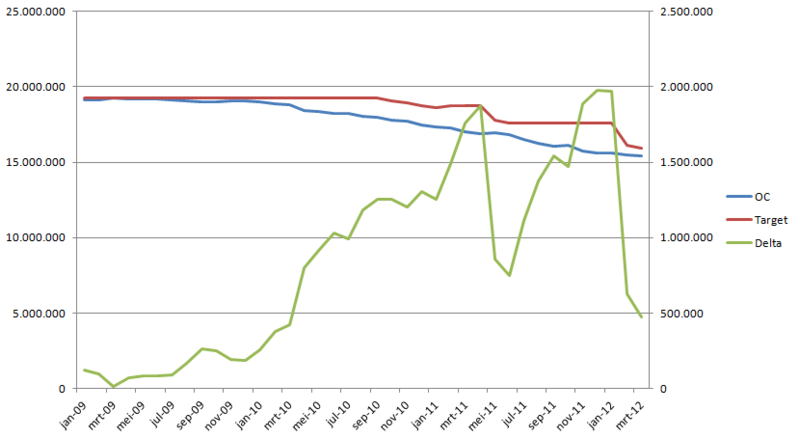 But it was a close call: the increase in share price is obviously not positive for the risk/reward ratio. URB-A.TO: The discount has been getting smaller since I initiated my position, and the recent transaction was also a small negative development. So far there isn’t anything in my portfolio that I think I should sell right now. Cash is in my opinion one of the least attractive assets with an almost guaranteed negative real yield. But if a better opportunity comes along I do have two positions on the hot seat. Long everything mentioned in this post. This entry was posted in Portfolio and tagged CNRD.PK, DSWL, ORGN.PK, SALM, URB-A.TO on July 2, 2012 by Alpha Vulture. Origen Financial manages a portfolio of manufactured housing loans and asset backed securities (ABS). The company delisted in 2008 and is in liquidation mode since. It sold the loan originating and servicing business and is now only managing seven separate trusts that were created between 2004 and 2007 and hold housing loans. The trusts have debt that is non recourse to the parent company. Because some trusts are performing well while others have suffered substantial losses the consolidated balance sheet is useless to evaluate the available asset value, creating a potential opportunity. The idea shares many similarities with Gramercy Capital that I have written up before, but in the end that one was just too hard to value for me (I’m considering giving that a new shot though). Origen reports monthly performance numbers for the ABS trusts on their website making it easier to value the assets of the company. Since almost all the assets of the company are within those trusts they offer the key to determine the asset value of the company. As already explained Origin Financial holds interests in seven different trusts. The trusts are separate entities that have non-recourse debt. While some trusts are performing and producing cash flow to the parent company other trusts are underwater and are probably never going to produce any cash flow. The cash flow from these trusts is one way traffic: it can only flow from the trust to Origen Financial, not the other way around. 2004-A, 2004-B and 2005-A: these are performing fine and produced 11.7M in cash flow to the parent company the past twelve months. 2005-B: hasn’t produced any cash the past years, but probably does have some value since it is close to meeting requirements. 2006-A, 2007-A, 2007-B: no value? Each trust started with several layers of debt and a pool of loans with a face value higher than the total amount of debt. To take the 2004-A trust as an example: this one started with $200M in debt that was backed by $239M in face value of contracts with an average contract rate of ~10%. The debt is sliced in several layers. The most senior layer has the lowest interest rate, but it does have the highest rating because when loans default these defaults are first absorbed by the excess amount of collateral and then by the more junior debt levels. Origen Financial doesn’t own the debt of the trusts (with one small exception) but the remaining equity, so to get cash the interest on the notes needs to get paid first and certain targets need to be met. Most importantly there needs to be an amount of excess collateral available before distributions to Origen Financial can be made. Since all defaults are absorbed by the overcollateral the difference between the interest paid to the debt and the interest received on the total loan pool has to be big enough to absorb these defaults. The equity interest in the trust is leveraged to the default rate of the underlying contracts, and when it’s spikes any excess overcollateral can be wiped out easily. This is exactly what happened with the 2006 and 2007 trusts. All the trusts start liquidating as soon as they are created. Loans get repaid, default or reach maturity and when this happens the note holders of the trust get repaid as well (starting with the most senior notes). To take the 2004-A trust again as example: it started with $200M in debt and $239M in contract face value, and at the moment $55.7M in debt is remaining and $81.3M of contract face value. When the amount of debt is dropping the amount of overcollateralization that is required is also dropping. The trust started with an overcollateralization target of $42.8M, and the target is now $25.6M. With the target dropping the excess money can be distributed freely to Origen. To determine the value of the interests that Origen has in the trusts the amount of overcollateralization is a dirty shortcut to get some idea of the available value. The 2004-A, 2004-B and 2005-A trust have a total of $62.5M in excess collateral, but this is understating the value of these trusts. For the past three years these trusts all have produced cash flow in excess of the return of overcollateral. This basically means that the current default rate is lower than the delta between the rate paid to the ABS note holders and the rate that the underlying assets are paying. The table below summarizes the performance data from the three performing trusts. As is visible the amount of required overcollateral dropped by a total of $9.2M the past twelve months while a total of $11.7M was distributed to Origen. So taking the total overcollateralization for these trusts as the total asset value is too pessimistic. At the same time it’s too optimistic for the 2005-B trust. This trust has significant OC ($15.4M), but here defaults have been eating away at the excess collateral for the past years. The graph below shows the OC target, the actual OC and the delta between them. As is visible the trust is very close to meeting it’s OC target, but so far the available amount of OC is dropping at a nearly identical rate as the target. If this trend continues the trust would have at the end of it’s life no OC available, and it would not have produced any cash flows to Origen. It’s highly likely that this trust does have some value, but it’s almost certainly a lot less than the current amount of OC available. Usually the default risk decreases when the portfolio ages because at the end you keep the people that have been paying you back for years, and at the same time the loan to value ratio is on average going down because principal payments get made. Answering the question how much value this trust has is very hard. Not only do you need to estimate how much of the overcollateralization is actually excess collateral and will be returned to Origen, the timing of these payments also matter a lot if you want to determine the current value. A scenario where the trust would start to create some cash flow this year would be way more favorable than a scenario where the cash only starts flowing after 5 years. I’m going to take the easy and conservative option and simply ignore any potential value this trust could have. Just by looking at the graph it should be clear that the optional redemption threshold is probably going to be reached somewhere in 2014, maybe 2015. And while it’s called an optional redemption, I think you can be confident that it’s going to be used, since the prospectus states that when the servicer fails to exercise his purchase option an auction process is started to sell the trust assets at the highest possible price. But that’s probably not necessary since the trust holds loans that pay around 10%, so buying the assets and retiring the remaining debt at par should be an attractive transaction in the current low-rate interest environment. The story is roughly the same for the 2004-B en 2005-A trusts: these should reach the thresholds a bit later, probably somewhere in 2015. When this happens the remaining OC is returned to Origen Financial. If you would throw this in Excel you will get a NPV of $42M while the current market capitalization is $36M. This scenario is especially pessimistic because in reality a lot of cash would be returned earlier, although it’s hard to model this exactly. In 2011 $11.3M in cash flow was generated while $10.9M was distributed to shareholders. You should probably asume that this amount shrinks slowly every year going forward, until the redemption thresholds are reached. At the same time this valuation ignores the overhead costs of the Origen Financial entity itself. These should be around $2M a year, but the excess interest received above the return of OC should easily be able to cover these costs ($2.5M was received the past year). Another minor source of value is the fact that the company holds $3.5M in notes: probably the B2 notes in the 2005-B trust since these have exactly $3.5M in face value outstanding. These notes have a 7.2% yield and are protected by 15.4M in OC, so these should probably be at least worth par (and should add $0.14/share in value). The company delisted in 2008 and is only publishing financial statements since, so I don’t know how much insiders exactly own today. In the 2008 annual report insiders and directors as a group owned 37.2% of the company. More interesting is the Succes Fee Letter Agreement with the CEO that gives him incentive to work towards liquidating the company since he will be paid a 1% bonus based on the value of a liquidity transaction. Origen Financial got in trouble in 2007 in the height of the financial crisis. It had to sell the loans it owned at large losses (before creating an ABS trust it needs to own a bunch of loans first), it required a rescue loan, and it sold the loan originating and servicing business. At the moment the company doesn’t have any debt at the parent level anymore, and it started distributing liquidation payments in 2010. Origen paid $2.6M in 2010, $10.9M in 2011 and $3.9M has been paid so far in 2012. 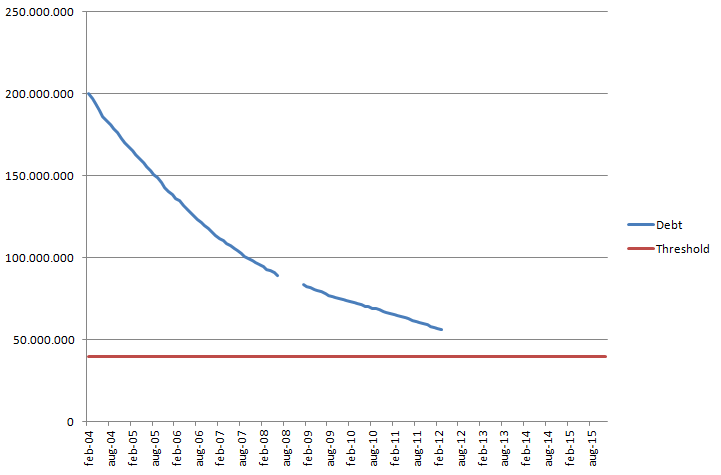 So this shows that liquidation payments are at the moment occurring at a rapid rate. The valuation work in this write-up has been crude for assets this complicated, but I think it’s sufficient to show that the asset value behind the Origen Financial is not only significantly more than the current market cap, there is also a strong catalyst in a few years time when the trusts reach the ‘optional’ redemption thresholds. At the same time management has shown that it is willing to liquidate the company and return capital. While I do think Origen Financial is a compelling opportunity, it’s not without risks, and I wouldn’t want to buy a huge position. There is a lot of leverage at work, although that’s partly offset by the fact that money extracted from the trusts can never flow back. This entry was posted in Portfolio and tagged ORGN.PK on May 10, 2012 by Alpha Vulture.